Goldman Sachs makes its top picks for 2014 in equities, commodities, currency and credit. NEW YORK (TheStreet) -- With 2014 right around the corner, Goldman Sachs highlights six top trading ideas for the coming year, all gleaned from its senior analysts. 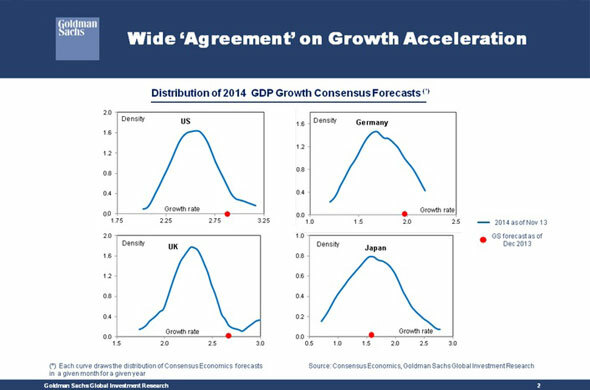 The first Goldman Sachs slide illustrates the bank's distribution of growth forecasts for 2014. The graph shows consensus economic forecasts punctuated by Goldman Sachs' projections, which show up as red dots. Goldman's projection for the U.S. and the United Kingdom is higher than the consensus and represents an improvement over the pace of growth for 2013. 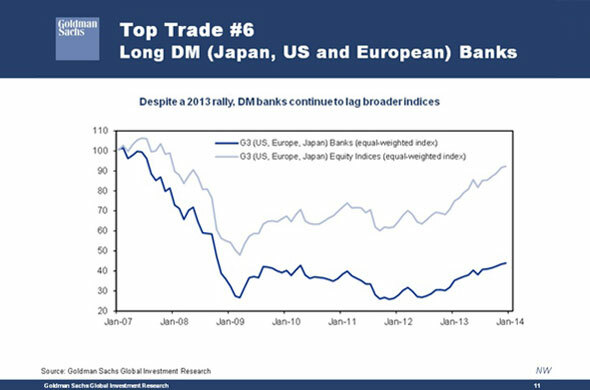 For Japan, and also partly for Germany and the European countries, Goldman's numbers are much closer to the consensus. The first is based on expectations for a decline in the fiscal drag over the balance of 2014 and 2015 relative to the experience of the last several years. This fiscal drag is estimated to be 100 to 125 basis points for the U.S. and 50 to 75 basis points for the euro zone. Secondly, Goldman's analysis points to a more abundant supply of key industrial commodities. The third factor is Goldman Sachs' expectation of a sustained decline in systemic risks emanating from the euro area. This reflects the central role played by the European Central Bank and the European Stability Mechanism (ESM) in providing funding to peripheral banks and sovereigns alongside the prospect of a banking union. "The one thing that I would say however is that the agreement around our views, more than in recent years, is pretty high," said London-based Francesco Garzarelli during an investor presentation this week. On the dimension of monetary policy, Goldman Sachs expects policy rates to remain very low, stretched out into 2017. 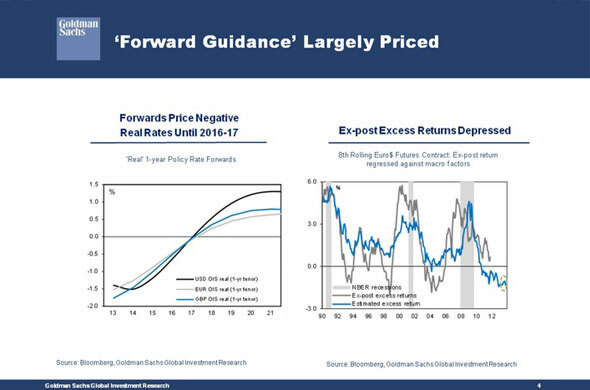 The graph on the left shows the four real rates in the three major global blocs, and shows that the market is saying that through 2017 these rates are likely to remain negative. The chart on the right shows expectations of losing money as if it was in real terms by sitting in cash for the next three years, a situation analogous with experiences of the past quarter-century. In short, growth should be picking up with relatively low inflation and there is now more consensus around this view, which means that asset volatility and the risk premium around assets should be lower. Of course, equity markets worldwide have widely benefited from very accommodative monetary policies. In commodities, London-based Max Layton says Goldman Sachs has a comparatively benign energy price outlook which supports its pro-risk and pro-U.S. growth bias, and is supportive of the long-U.S. equities leg of Goldman's first top trade in particular. Overall, Goldman believes that the energy price constraints that may have presented themselves in prior cycles are unlikely to derail an acceleration or the anticipated acceleration in global growth in 2014. The major advantage for this cycle relative to the previous one is the shale revolution, which is expected to continue to bring higher oil production in the U.S., capping oil upside and helping to keep global inflationary pressures under wraps. If anything, there are downside risks to Goldman's second half 2014 forecasts for oil, given the potential for a pick-up in Libyan and Iranian oil output, and the likely normalization in production rates in Brazil, the Gulf of Mexico and the North Sea. In other commodities, Goldman holds bearish views on copper, iron ore, gold and soybeans. In each of these commodities, it sees prices falling by more than 10% in 2014. These views are consistent with its short Australian dollar leg of the first top trade as well as the short copper leg of the fourth top trade. 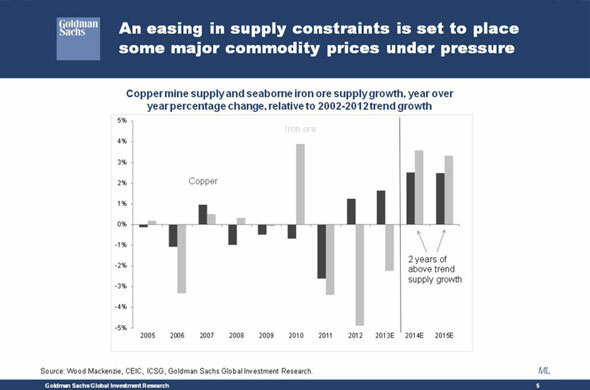 As the slide above shows, the primary driver of Goldman's bearish views on copper and iron ore is its forecast of sustained, above-trend supply growth over the next two years. This strong supply is pretty much the delayed result of the massive capital expenditure by miners over the past decade, which has come in response to extremely high prices over that period. So clearly one of the elements of the Australian dollar short is that Australia's a major commodity exporter and the currency is very highly positively correlated with the prices of copper and iron ore in particular. Copper, iron ore, and gold together account for about 43% of Australian commodity exports. Rationale: This trade connects back to expectations that developed market growth will pick up as the U.S. grows beyond trend, and forecasts that policy will remain accommodative particularly through forward guidance heading into 2014. "It reflects a view that the most attractive risk premium out there still is in equities and DM [developed market] equity, and that's a function of what real rates are as reflected by bond markets and what earnings yields are in developed markets and the S&P in particular." 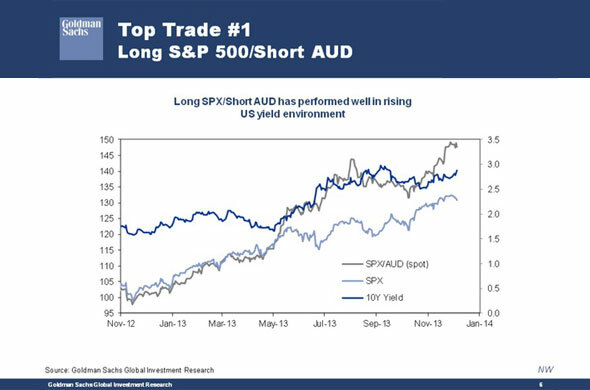 In order to create an attractive pair trade that owns developed market equity risk premium while having a way to hedge that risk, Weisberger chooses the Australian dollar as a short. First and foremost behind this reasoning is that the Australian currency has a correlation to the S&P but is increasingly becoming negatively correlated to U.S. rates. The Australian dollar is also positioned to weaken over the year on its own merits both in terms of the commodity story, and copper and metals in particular, as well as through expectations of further rate cuts nationally. For the S&P, Weisberger has an upside target above current levels, and for the Australian dollar, he has a target below existing levels. In other words, those assets should move in directions of their own and serve as a pair that can give exposure to the key themes of the year, including above-trend developed market growth and attractive equity premiums, while simultaneously offering isolation from the key risk of a potential move higher in yields. Risks: The risk to the trade are that growth views could disappoint, or on the other hand, that growth perceptions are so strong that they start to push against some of Goldman Sachs' more bearish forecasts on the commodity markets and commodity-exposed currencies. In fact, the biggest risk that hasn't been factored into Weisberger's baseline views is that GDP growth expectations move above trend and become more visible to the markets, translating into concerns about rates selling off and higher yields. For now, Weisberger is expecting yields to move higher over the year, but doesn't foresee any violent action that could derail his optimistic view on equities. Rationale: The yield differential between these two financial instruments is currently around -67 basis points, down from -61, when Ardagna and her team began to trade this position on Nov. 26. She expects the trade to reach around -130 basis points. 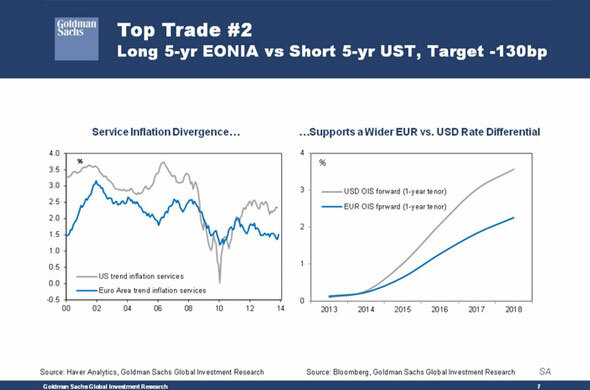 The macro factors that underpin this trade recommendation are connected to Goldman's forecasts for the divergence in growth and inflation on the two sides of the Atlantic and the discrepancies between Goldman Sachs' own monetary policy views and that of the market. Pertaining to the first set of factors, Goldman expects real GDP growth to accelerate across the major developed economies over the coming quarters and inflation to slowly make its way back up from the current low levels. 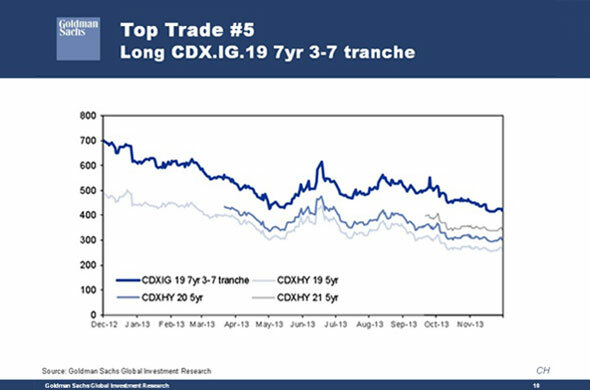 As economic activity picks up steam, and core inflation slowly accelerates, Ardagna expects intermediate maturity yields also to be priced higher. But this dynamic is likely to materialize sooner and faster in the U.S. than in the euro area. Relative to GDP growth, Goldman forecasts U.S. growth to be above trend from 2014, while in the euro area, this will only occur from 2015. In addition, Goldman's 2014 GDP growth forecast for the euro area is in line with that of the consensus, while its U.S. GDP forecast is around 50 basis points above that of the consensus. Finally, downside risks to economic activity are certainly going to be higher in the euro area than in the U.S. Relative to inflation dynamics, the recent data shows that consumer price inflation has stabilized in the U.S., particularly when looking at service inflation, as illustrated in the above slide. On the other hand, inflation is still trending downwards in the euro area. The second set of rationale behind Ardagna's trade recommendations relates to Goldman's monetary policy views and those of the markets. Its 2014 outlook is characterized by central banks reinforcing the forward guidance on policy rates. Currently however, a very accommodative monetary policy stance is still largely priced into the U.S. But as growth strengthens in the U.S., the markets according to Goldman could challenge the Fed's commitment to keep front end rates so low for so long. On the other hand, the market is underestimating the possibility that the ECB can provide further easing as not only is the euro area paced to see inflation stabilization, it's also positioned to prevent spillovers from the U.S. rates market and react to tensions scrutinized during the Asset Quality Review process. Risks: The first is timing. Goldman Sachs expects that the Fed, together with tapering its asset purchasing program in March, will also strengthen forward guidance. But if it were contrary to expectations, there could be a flattening of the two-year to five-year U.S. curve because investors might try to squeeze more carry and roll down from the U.S. term structure. In this case however, given the forecast for growth and inflation, Ardagna would actually recommend to be in this position in the direction suggested above. She said she thinks that the anchoring of short-term rates could also result in increasing long-term inflation expectations as growth picks up and U.S. financial conditions remain very easy. The second risk would clearly come from the possibility that Goldman's market forecasts might not be realized. On the U.S. side, the risk is that growth will be lower than expected, and on the euro area side, the trade recommended would certainly suffer from the faster normalization of inflation. In this case, it is possible that market participants would reassess the ECB's easing bias. Rationale: Stolper recently changed his view and forecast on the Canadian dollar (CAD), for a twofold reason. First of all, there's been a gradual shift in the Bank of Canada's policy under new governor Stephen Poloz. In the last statement, there were indications of more concerns about the export industry and weakness in the sector, and about relatively low inflation. Both are consistent with a potentially looser monetary policy outlook for Canada. Stolper isn't actually forecasting cuts, but the risk towards easier policy has notably increased in the last few months. 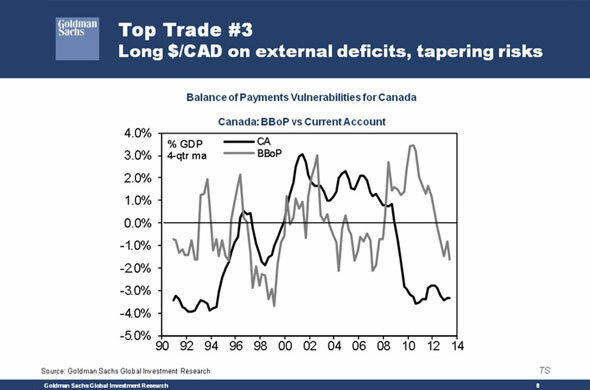 The second, more important factor is the notable indications of weakening in Canada's balance of payments over the last several quarters. Since the financial crisis, Canada lost a lot of manufacturing activity, and the current account in Canada has pretty persistently been in deficit at about 3% to 4% of GDP. The deficit was initially easily funded because Canada had a much more stable banking sector and a strong link to reserve diversification out of the major currencies into commodity currencies. In recent months though, there's been a change in the banking sector, possibly linked to the very strong rise in housing prices in Canada at a time when the central bank has started to slow down the inflows into commodity currencies over the last couple of quarters. That means that ultimately, the funding side of the larger current account deficit has become much more difficult, exerting downside pressure on the Canadian dollar. That in itself would be consistent with a weaker Canadian dollar, meaning a higher U.S. dollar. One additional factor that could accelerate this, when thought in terms of interest rate differentials, is the link to tapering and stronger growth in the U.S., particularly with a rise in the intermediate interest rate; if unmatched by a similar rise in Canadian rates, there might actually be an interest rate differential working in favor of the U.S. Dollar/CAD. Stolper's trade target is USD1.14 to the CAD. Rationale: The importance of emerging market differentiations, the positive market implications of China's growth stability, and the commodity price downsides generated by seemingly abundant supply dynamics are reflected in this trade. Firstly, the trade captures the differentiation between emerging market assets and the various emerging market (EM) economies. Trivedi says emerging market equities is the best place to be among EM asset classes, especially in an equity-friendly world, globally; EM currencies and rates on the other hand are likely to face further challenges since a U.S. recovery also accompanies higher U.S. rates. Within EMs, China and its exports are well-placed to benefit from developed market expansion compared to EMs with large external imbalances. Indications of better export data most recently appeared in reports released in China over the weekend. The second theme of this trade is that a stable China may be good enough. Through the long recommendation in H shares, and short copper, Trivedi wants to capture the view that China's growth path is likely to involve a rebalancing rather than any cyclical, sharp acceleration. Stable growth and slowing domestic demand coupled with external strength and stability is sufficient to make it really attractive to own assets directly connected to China and enough to boost risk sentiment particularly after several years of poor performance from Chinese equity indices. Third, the recommendation is also linked of course to the theme of oversupply-driven downside risks across commodities, with copper clearly being one of them. Trivedi's China equities strategy has about a 19% year-end upside target, while the commodities strategy team's 2014 copper forecast implies about a 13% downside. That makes a combined target of +25%, which is more modest than the two separate forecasts would suggest. 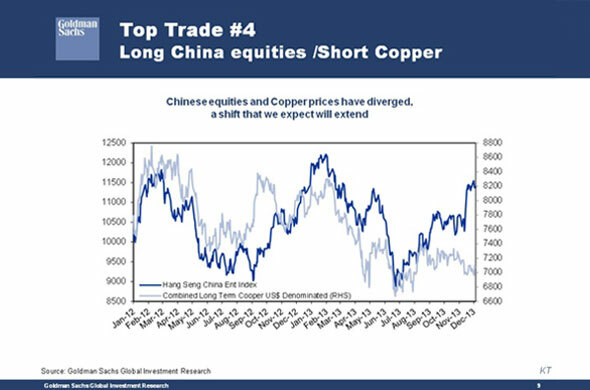 Risks: The trade would require that Chinese equities drift apart from copper prices. Though it might seem difficult given the track record of recent years, this has already begun to occur in recent months, and the fundamentals of Goldman Sachs' forecasts would argue for this to continue. The second risk is if growth is stronger than expected, both assets could move higher, which could erode the total return of the combined position. Finally, if the rebalancing process in China is bumpier than expected, this would certainly hit the equity markets, though the short copper leg should provide some protection against that. Rationale: The way to think about buying this lower mezzanine tranche and selling protection on it is to think of it as selling a put on default risks, because from a fundamental view, it's very unlikely the defaults in investment grade credit exceeds 3%. This trade also benefits from the very friendly macro environment where the credit world is likely to be relatively range-bound. The trade is designed to be a long carry trade that benefits from what is shaping up to be a stable, carry-friendly bottom-up fundamental environment over the coming year, where default conditions remain quite benign on expectations of gradually improving growth amid ongoing central bank accommodation. Goldman's forecast for credit spreads in 2014 envisions a modest amount of tightening where the direction of the spread is basically neutral. There may be bouts of volatility around better growth, which brings forward the expectations of sooner than expected rate hikes, and a bit of adjustment cost as QE-tapering begins. Ultimately though, these will likely be more transitory than permanent dislocations based on the Goldman's strong notion that there's a lot of production slack in the economy and that the Fed is going to keep the federal funds rate around zero until early 2016. The reason Himmelberg decided to recommend this trade in tranche format as opposed to plain vanilla high-yield is because a little bit of leverage is called for in a world where the extraction of carry trades often prevails and volatility could heat up a bit. As the above slide shows, the 3-7 tranche makes a lot of sense, with the running spread equivalent for this tranche carrying with it materially more, or about another 100 basis points of spread. The tranche has rallied a bit since the recommendation, but the year-end carry on this trade could still be 600 or 700 basis points, according to Himmelberg. Risks: It's a very attractive carry trade that's unlikely to be undone by bottom-up deteriorations. Rationale: This is the only trade where Goldman Sachs is long-only in the equity space. At the outset, one of Goldman's top trades this past year has been to be long U.S. banks, a trade it took on towards the end of the year after having raised the target and the stop. While it's been on the bank's risk watch list during the so-called "taper tantrum," Weisberger surmises that U.S. banks' risk premium can continue to compress based on their own merits and as a reflection of a broader biased to be long equities. Generally, the U.S., Japan and European equity markets have all had a strong year in 2013, but Weisberger predicts that their financial sectors will continue to garner strength given their tendency to be geared towards domestic demand and domestic demand acceleration. Growth acceleration in the U.S. is moving to above trend rates; there's been a pick-up in Europe from very depressed levels; and a bit of stabilization in Japan has also been taking place. With a little more reform and forward-looking optimism, all of them should see support in the financial sectors. Another point of support: while Weisberger sees front-end yield curves remaining anchored, the back-end is where there might be some moves. Although yield curves are already steep and may not steepen much more, the steepness is yet to be reflected by way of stronger net interest margins in many of the banking indices and the banking sector. And as that flows through, bank stocks should experience increased support, as in general they tend to do well in rising rate environments. Risks: The risks here are probably clearer than some of Goldman's other trades in the sense that the regulatory backdrop, particularly in the U.S. and Europe, still look challenging, but are well-flagged and well-known. The key risk to this trade is if such headwinds heat up, coupled with some growth disappointments in the developed markets. --Written by Andrea Tse in New York.